He may be the world’s foremost authority on the man who created the most instantly recognized image in the world, and he married the woman of his dreams, who lived halfway across the country, after purchasing her art work for 18 years. A 1971 journalism graduate of the University of Maryland, Henry Zecher was a sports writer and sports editor for the Delaware State News in Dover, Delaware, for five years. Subsequently employed in Federal government human resources, he is now a free-lance writer specializing in historical topics. Ever since college, Henry was interested in Sherlock Holmes, and amassed a small library of Holmes and Holmes-related books and magazines. 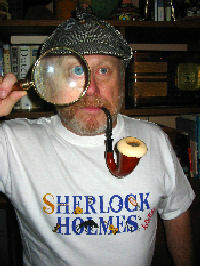 A three-part overview of the entire Holmes phenomenon, Sherlock Holmes and the 21st Century, appeared in The Pipe Smoker’s Ephemeris, a biannual magazine devoted to pipe and cigar smoking and published by Tom Dunn of College Point, New York. This led to a seven-part series on Gillette in the Ephemeris, which was subsequently expanded into a soon-to-be-published full-length biography. In conducting his research, he amassed a large collection of photographs which he incorporated into a slide presentation, which he has presented before Sherlockian societies and other interested groups in various parts of the country. Sherlockians ~ those dedicated to the study of Sherlock Holmes and Dr. Watson ~ have unanimously proclaimed this to be the finest special presentation ever given at a Sherlockian event. He has been active for many years in First Alliance Church of Silver Spring, Maryland, in evangelistic and youth ministries. His first historical piece was an evaluation of German Reformer Martin Luther's impact on the English Bible (published in Christianity Today Magazine, October 23, 1983, republished several more times, recorded for the blind, and finally included in Christian History Magazine's special Martin Luther issue). He later published, in The Velikovskian (Vol. III, No. 1), a Journal of Myth, History and Science, the first analysis, from a Biblical and historical point of view, of the Papyrus Ipuwer, claimed by Immanuel Velikovsky and many others to have been an Egyptian version of the plagues on Egypt described in the Book of Exodus. Many of his articles appeared in The Pipe Smoker’s Ephemeris, edited and published by the late Tom Dunn in College Point, New York. These included tributes to C.S. Lewis after the release of the hit film Shadowlands and George Burns upon his death at age 100. For many years Henry was headed for the life of a retired suburban bachelor when he sent a fateful email to an artist whose work he had been purchasing for 18 years. Her Serbian name was Vesilka (Ves-eel-kuh), meaning happy and gay. In her other identity, she was Anna Bandana with a paintbrush in her hand. On any given day ~ depending on which of her Gemini personalities was dominant at the moment ~ she could be Josephine to his Napoleon, Abigail Adams to his John Adams, her Ladyship to his Lordship, Ruth to his Boaz, Juliette to his Romeo, the Wicked Wench of Waukesha, or the Seven Faces of Eve. If he became her biblical scholar, she became his biblical blond. Gay’s cartoons are personalized to one’s hobby, profession, special interest, or various topics. The print is then personalized to the intended recipient, including the recipient’s name and other personal information relevant to the picture. 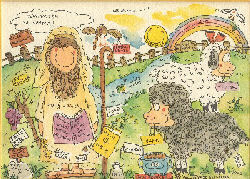 A friend gave Henry one of her prints (The Good Shepherd) in 1983, with much humorous and personal information in it. Gay herself personalized the print, little realizing she was providing customer service to her future husband. Charmed by the picture, Henry ordered her catalogue and began purchasing the prints. In 1986 she put her photograph in her catalogue for the first time and Henry was in love. 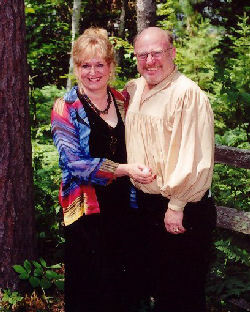 But there were obstablces ~ she was married and lived in Wisconsin, while he lived in Rockville, Maryland. But, ever since the dawn of the Space Age, Henry’s mother had hoped that he would find a solid, mature, even matronly companion to keep him company in his sunset years. What she got instead were two teenagers, cleverly disguised as responsible adults ~ bodies by Nautilus, brains by Mattel ~ ooging out their children by behaving like giddy kids discovering love for the first time. Which they were. They were definitely not acting their ages, and the Geezer Love Fest became the most popular show on the road. Strangers in subway stations, on street corners, and in restaurants, told them how adorable they were, or how wonderful it was to see two people so in love. At the airport once, as they embraced, snuggled, and kissed, an entire row of people sat watching and giggling. When they broke their embrace to go after her luggage, the entire row of people applauded. Really! They took bows. They may not have been young, but they were immature. The romance of the century began when he emailed her in the Fall of 2000 about a special Sherlockian print. The emails continued on a variety of topics ~ humor, politics, history, travel ~ until they discovered the telephone. Then they talked every night, and a standard Saturday night phone date might last six or seven hours. Of course, they exchanged photographs ~ she sent him pics of Cameron Diaz and he sent her photos of Brad Pitt, so she knew she wasn’t getting Danny DeVito as the Penguin and he wasn’t getting Roseanne Barr on a bad hair day. They met face-to-face for the first time at Reagan National Airport. In the words of an old Steve Allen song, they kissed first, and then they said Hello. The proposal came later, at the stroke of midnight on New Year’s Eve. Gay’s favorite Christian writer, and his, is C.S. Lewis, who married Joy Davidman at age 58 and found the joy that had escaped him in his 20's. They had three idyllic years together before the cancer snuffed out her life. In the film Shadowlands ~ starring Anthony Hopkins as Lewis, and based on their love story ~ Lewis proposes to Joy as she lays on her deathbed. She answers, as the real Joy answered, Just this once. Henry would have loved for Gay to say Just this once, but he could not ask it without revealing his plans. So, at the stroke of midnight on New Years Eve, he proposed. Without a moment’s hesitation, she responded, Just this once! 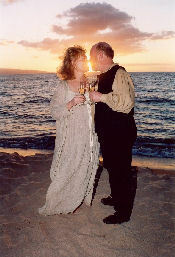 Not long after, on February 14, 2003, at sunset on a Beach on the island of Maui, she became Mrs. Gay Zurich Zecher. February 14 thus became their wedding day, Valentine’s Day, his own parents’ wedding anniversary, and Gay’s father’s birthday. Grand Slam! So, in the Spirit and in water colors, the Lord brought them together, and ~ as always ~ He did it right. Her dad’s favorite entertainer was Dean Martin, and Henry’s favorite entertainer was Dean Martin. Like, what else did a couple need? But there was more. They are compatible in every way. Their outlooks, values, and tastes were entirely the same. Their communication was so deep they completed each other’s thoughts, almost read each other’s minds. Family and friends, of course, were entirely supportive. His sister assured his mother, "They dropped the felony charges, and she hasn’t been dangerous at all since they put her on her medication, but, I’m locking the door when she comes, just in case." Gay’s daughter Katy was equally supportive: "You know he’s a serial killer, don’t you? He has to do all those good deeds as part of his community service when they let him out of the House of Corrections." Then, she added, "Besides, he’s probably a bigamist". Son Richard, a police officer, ran an FBI background check on Henry. And, when told that Gay was the Alpha and Omega of women, Sherlockian Joel Sentor of Classic Specialties wrote to him, "I still can't quite figure out what such an absolutely perfect woman would want with you!" Henry’s family all fell in love with Gay, his mother finding in her another daughter, and his sister finding in her the sister she never had. What he found was a combination of Gracie Allen and Lucy Ricardo. One night, in one of our biblical discussions, he quoted the Old Testament Book of Exaltations [it’s sandwiched in between Second Esther and Hezekiah], and she went looking for it. "I figured it had to be there because you’re a deacon" she told him, while roasting him alive for his prank. But, that was not the end of it. 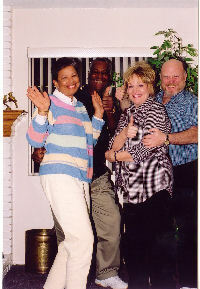 An oft-told story is that of his dear friends Cliff and Freddie Harris in California (with Henry and Gay right). Freddie and Cliff had not yet met when she made a list of 16 attributes she desired in the perfect husband, a list she almost immediately lost. Cliff had just walked out of the state penitentiary after 20 years of drug addiction and crime. When they did meet, he asked her out. They had such a splendid time that he asked her out again, and on their second date he proposed. She said Yes. Her friends were apoplectic: He was a convict, they said. He was a drug addict, they said. She was throwing her life away, they said. But, that was in 1985. Today, they are still on their honeymoon, and they run Drug Alternative Program, the most successful drug ministry in the world (more than 50 percent success rate). Before their tenth anniversary, Freddie found that long-lost list and wrote, On "May 11, 1995, Jesus led me to his list of 16 character traits that he specifically asked for in a husband. It was dated 4-28-84 and we were married on 5-10-85. Every request was granted to me, including pretty feet (Smile!). Isn't Jesus wonderful! And He's just that personal!" Freddie showed Henry the list, and said, "When God puts two people together, He does it right". He does, indeed! Some time before Henry and Gay connected, Gay had made a list in her journal of about 25 attributes she desired in her perfect man. She figured she had no chance of finding that man and ~ precisely as Freddie had done ~ Gay promptly lost her list. But, all this time, she was also praying for a miracle. Nothing specific. Just a miracle. After they had gotten to know each other pretty well, she found the list. Henry had all 25 attributes. "My list had 25 elements while Freddie’s only had 16", Gay joked, "so my man is better than her man!" But, Henry still didn’t get a perfect score. "You had them all," Gay told him, "but I only gave you 99 percent. I took away a point because of Exaltations. " There was, however, one minor difficulty. Trivial, really. Hardly worth mentioning: Gay still lived in Wisconsin. He still lived in Maryland. They reminded themselves that, during the Civil War, General and Mrs. Grant were apart and didn’t even have email. Henry and Gay both had email and the airlines. When he retired in 2006, he would move to Wisconsin. And, frankly, it took too long ~ all of their lives ~ for them to find each other. This is their time, and they’re together forever. As actor Will Smith said about his own marriage, "It’s Plan A all the way, and there is no Plan B!" Well, they now reside happily in Wisconsin, described by fellow Gillettean Susan Dahlinger as "Wall to wall cheese, where it isn't cows!"